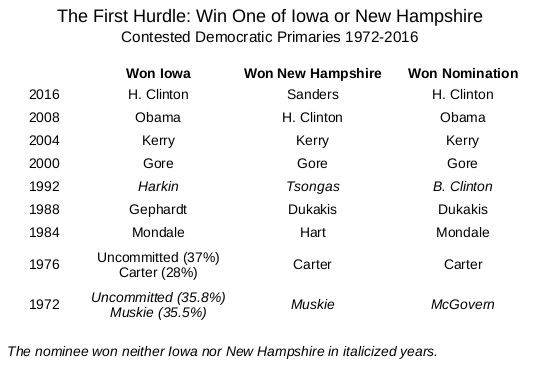 Only twice in nine elections has the eventual Democratic nominee not won one of Iowa or New Hampshire. Iowa remains fairly wide open, but Bernie Sanders may have the inside route in New Hampshire. The pace of attrition is swift in Presidential primaries. Usually only a few candidates remain standing after March 1st, so a victory in Iowa or New Hampshire can put a candidate far ahead of his or her rivals. In fact the eventual Democratic nominee won one or both of these states in seven of the past nine contested Presidential nominations. We can see a few different patterns over these campaigns. In 2000 and 2004 the “establishment” candidates, Al Gore and John Kerry, began strong and finished strong. Hillary Clinton’s campaigns resemble Walter Mondale’s effort in 1984. Both Clinton and Mondale were establishment choices but faced strong opposition from outsiders Gary Hart, Barack Obama, and Bernie Sanders. 2020 has no establishment Democratic candidate, so might it follow one of the other patterns? In the two outlier elections, 1972 and 1992, the strong regional appeal of a few candidates masked the underlying strength of the eventual nominee. Maine Senator Edmund Muskie came second in Iowa in 1972 by just 0.3% of the vote behind “uncommitted.” When he arrived in neighboring New Hampshire, Muskie was expected to build on his Iowa win with a strong victory among his fellow New Englanders. Sadly for Muskie, he soon found himself the target of an infamous smear campaign involving confederates of Richard Nixon and the then virulently right-wing newspaper, the Manchester Union Leader. Confronted with a barrage of falsehoods, Muskie delivered an emotional speech, dubbed the “crying speech” in some quarters, outside the offices of the Union Leader. Muskie did win New Hampshire and the Illinois primary a few weeks later, but it was the second-place finisher in the Granite State, George McGovern, who went on to win the 1972 Presidential Nomination. In 1992 Iowa’s senior Senator, Tom Harkin, tossed his hat into the ring and promptly collected 77% of the Iowa caucus vote. After Super Tuesday he never contended again. New Hampshire that year was won by the junior Senator from neighboring Massachusetts, Paul Tsongas, but it was the strong second-place performance of Arkansas governor Bill Clinton that caught the eye of political observers. Tsongas beat Clinton by only 33% to 25%. The “Comeback Kid,” as Clinton billed himself, went on to win a number of primaries on Super Tuesday and eventually consolidated his hold on the nomination. 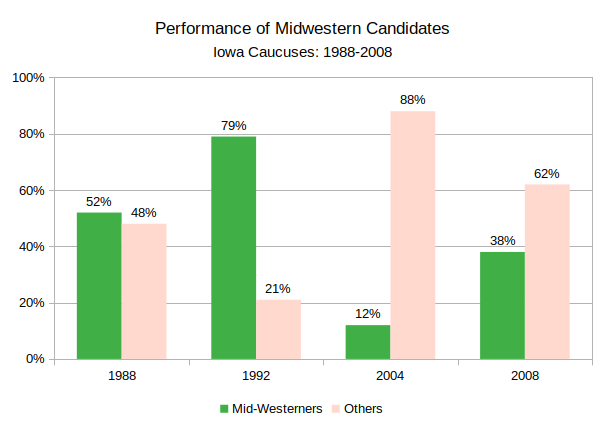 In an earlier article I discussed Iowa‘s apparent preference for Midwestern candidates. Sherrod Brown’s decision not to run for President leaves only Amy Klobuchar, the senior Senator from Minnesota, and South Bend, Indiana, mayor Pete Buttigieg as candidates who can lay claim to Midwestern roots. So far, though, neither candidate has caught on in the early Iowa polling. Klobuchar polls in the single digits, and Buttigieg has yet to break onto the list. Averaging the current Iowa polls gives former Vice President Joe Biden the lead at 27.3%, followed by Sanders at 15.4%, and California Senator Kamala Harris, former Texas Congressman “Beto” O’Rourke, and Massachusetts Senator Elizabeth Warren all with about ten percent. Name recognition obviously has a substantial influence on these figures, and the race could change substantially should Biden decide not to run. At the moment, though, Iowa seems fairly open. That is less true for New Hampshire. Bernie Sanders won a dramatic upset victory over Hillary Clinton in the 2016 New Hampshire primary by a margin of 60-38%. There is no reason to expect him not to do well again in 2020. His current polling average in the Granite State is about 21%, not far behind Joe Biden’s 25%. Harris and Warren come in around 9-10%. New Hampshire has certainly preferred fellow New Englanders over the years. Candidates from neighboring states have won five of the eight competitive New Hampshire primaries held starting in 1972. Despite his travails, Muskie did win the 1972 primary, as did Massachusetts Governor Michael Dukakis in 1988 and Massachusetts Senator Paul Tsongas in 1992. New Hampshire voters in 2004 spread their votes across three candidates from New England including eventual nominee Massachusetts Senator John Kerry. Yet with the exception of Sanders impressive victory in 2016, candidates from neighboring states have not won New Hampshire by overwhelming margins. And both Muskie’s and Sanders’s victories came in largely two-person races, which will certainly not be true next year. Sanders’s strength in New Hampshire comes at the expense of Elizabeth Warren. 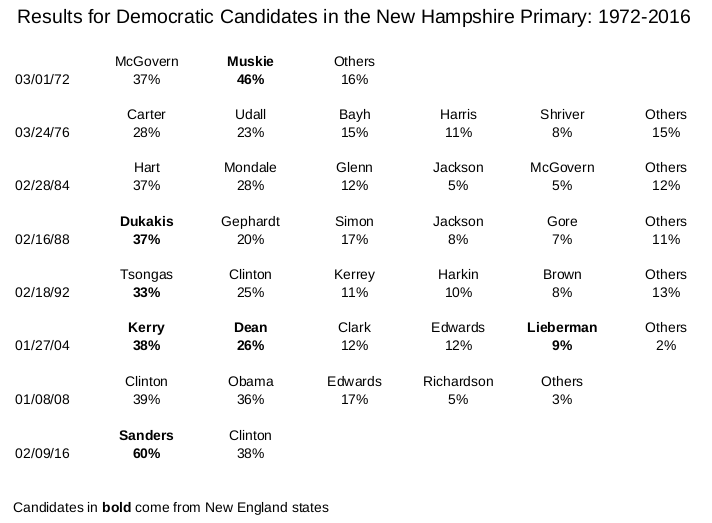 Together Sanders and Warren poll in the low to mid thirties, or about the total vote won by Dukakis and Tsongas. However Sanders outpolls Warren 21-9 on average. If Warren hopes to follow in the steps of Howard Dean in 2004 she’ll need to up her game. All told, though, the chances look good that Bernie Sanders could win the New Hampshire primary again and secure one of those two valuable slots in the early states. Can Midwesterner Amy Klobuchar Find Support in Iowa? Iowa Democrats’ preference for Midwesterners may work to Amy Klobuchar’s advantage. Whatever strategic reasoning influenced Amy Klobuchar to announce her almost-certain decision to run for President, the first-in-the-nation Iowa caucuses surely must have played a role. Historically, Midwestern candidates have had a slight advantage in these contests. No Midwestern candidates competed in the 2016 caucuses. In 1988, both Representative Richard Gephardt of Missouri and Senator Paul Simon of Illinois out-polled Massachusetts Governor Michael Dukakis, the eventual nominee. Four years later Iowa’s own Senator Tom Harkin took a run at the presidency and swamped his competitors. Gephardt ran again in 2004, but both he and perennial left-wing challenger Ohio Congressman Dennis Kucinich could only muster twelve percent between them against their major competitors, Senators John Kerry from Massachusetts and John Edwards of North Carolina. Four years later the candidate from neighboring Illinois, Senator Barack Obama, bested both Edwards and Hillary Clinton in the Iowa caucuses. Iowans seem to display a slight preference for viable Midwestern candidates. Harkin’s favorite-son endorsement in 1992 needs to be set aside, but both Gephardt and Simon showed considerable strength in Iowa. Even Barack Obama’s victory in 2008 fits the pattern. While his position as a Senator from Illinois was hardly his most noteworthy feature as a candidate, it might have swayed some Iowans who might otherwise have voted for Edwards or Clinton. Unfortunately the 2016 campaign did not provide any mid-Western contenders whose performance we might evaluate. The down side for Klobuchar is that, among these Midwestern candidates, only Barack Obama won the nomination. On the other hand, the winner of the Iowa caucuses in the past three competitive primaries, Kerry, Obama, and Hillary Clinton, went on to become the nominee. Can Klobuchar employ “Minnesota nice” to attract a similar plurality among Iowans next February? In the two Iowa polls released so far she’s running at three percent. Even in a field as crowded as 2020’s, she’d need to win well over a quarter of the caucus vote to have a chance at victory. Compared to recent presidents, only George H. W. Bush was as unpopular when standing for re-election as Donald Trump is today. Bush lost. Recent opinion polls, especially ones taken after the government shutdown had worn on for a few weeks, show Donald Trump considerably “underwater” in job-approval polls. On December 21st, the day before the shutdown, the running average on Trump’s job approval numbers at FiveThirtyEight put him at 42.2 percent approving, and 52.7 percent disapproving, for a “net approval” score of -10.5 (=42.2-52.7). Since then the gap between Trump’s approval and disapproval scores has substantially widened. Today, January 27th, FiveThirtyEight reports his approval score has fallen three points to 39.3 percent, while his disapproval score has increased substantially to 56.0 percent. His net approval score has now fallen to -16.7. Few recent Presidents have plumbed these depths of public opinion as Donald Trump. This chart presents the net approval scores of recent Presidents as measured by Gallup at three different times in their first terms: when inaugurated, at the time of the first midterm election, and once again at the time of the next Presidential election. Every President except Trump began his term of office with a positive net approval score that deteriorated over the next two years. George W. Bush showed the smallest decline because his approval had received a thirty-point boost after the 9/11 attacks. Being popular upon inauguration is no guarantee of continued popularity as Ronald Reagan and, especially, Barack Obama discovered. However they were both able to recover and reach positive territory in the Presidential election that followed. Only George H.W. Bush has stood for re-election with a net approval score below negative twenty like Trump’s current figure. Bush, of course, lost the 1992 election to Bill Clinton. George W. Bush managed to be re-elected with a net approval score of zero. 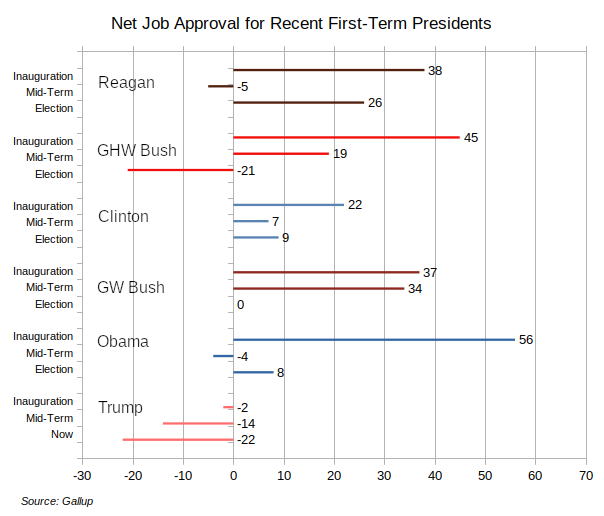 The remaining Presidents in the chart all had positive approval scores at the time of re-election and were sent back to Washington for a second term. Donald Trump has not seen a net approval score above zero since a week or two after he was inaugurated in 2017. It is hard to fathom how he can recover even to a net zero score like George W. Bush had in 2004, never mind reaching into positive territory. Both Clinton and Obama managed to win re-election with net approval scores in the single digits. Even that relatively low hurdle seems pretty distant for Donald Trump at this point. 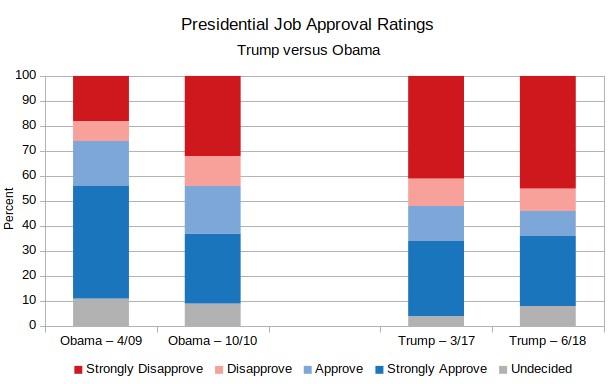 One reason we are unlikely to see a substantial movement in Trump’s direction is the large number of people who report “strongly” disapproving of Trump’s performance. The newest Washington Post poll shows that most peoples’ opinions of Trump fall into either the strongly approve (28 percent) or strongly disapprove (49 percent) categories. Only nine percent report they “somewhat” approve of his performance, and another nine percent “somewhat” disapprove. Obama could recover from his 2010 “shellacking” because fewer people chose the “strongly disapprove” option when asked about him prior to the 2010 midterms. Trump has fewer chances to bring people back to his side because opinions about him are much more locked in stone. Donald Trump could, of course, confound all his observers as he did in 2016. However it is unlikely he will be able to run against as unpopular a candidate as Hillary Clinton turned out to be. Observers of the 2020 primaries expect a huge crop of Democratic candidates to declare before next February’s Iowa caucuses. History tells us that few of those hopefuls will still be contending for the nomination by mid-March. Pundits have routinely suggested that the field for the 2020 Democratic Presidential nomination might range upward of a dozen candidates. As of today, January 22, 2019, a total of seven candidates have announced their intention to run — Julian Castro, John Delaney, Tulsi Gabbard, Kirsten Gillibrand, Kamala Harris, Richard Ojeda and Elizabeth Warren. Wikipedia lists another twenty people who have “publicly expressed interest” in running including Joe Biden, Cory Booker, Sherrod Brown, Amy Klobuchar, Michael Bloomberg, Jay Inslee, Beto O’Rourke and Bernie Sanders. The field could certainly exceed a dozen candidates before the Iowa caucuses take place on February 3, 2020. The Democrats saw eight contenders in the 2004 primary race that was eventually won by John Kerry. Michael Dukakis in 1988 and Barack Obama in 2008 fended off six other competitors in their paths to winning the nomination. Most of these competitors fell by the wayside early. 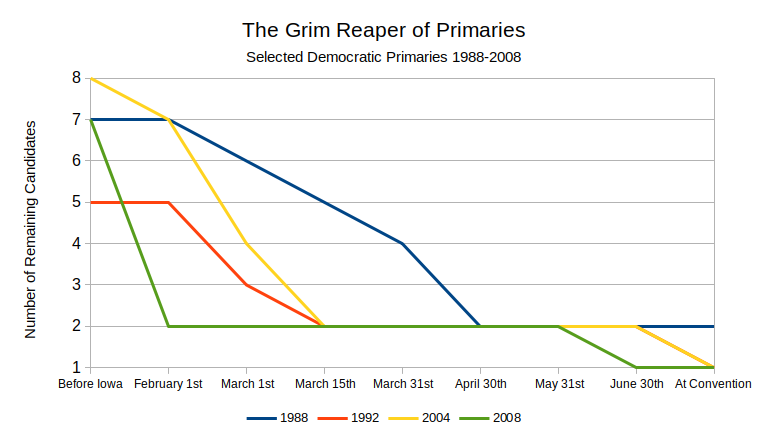 In 1992, 2004, and 2008 just two candidates remained by March 15th. In 1988 Al Gore and Paul Simon continued their contests against Dukakis until April, while Jesse Jackson maintained his symbolic quest into the Convention . This drastic winnowing of candidates reflects a variety of forces. All the campaigns compete for funds and staffers. Candidates who fail to make a strong showing in the early races see their access to contributions and staff dry up. These resource limitations are exacerbated by the need to attract and maintain media attention. While it might be possible to cover a dozen candidates at the outset, media organizations inexorably must target their resources to a much smaller number of candidates deemed “viable” by the press and party professionals. So while we may see long lists of potential Presidential candidates lining up in Iowa and New Hampshire, it is hard to imagine there being more than three or four candidates remaining in the race after Super Tuesday, March 3rd. 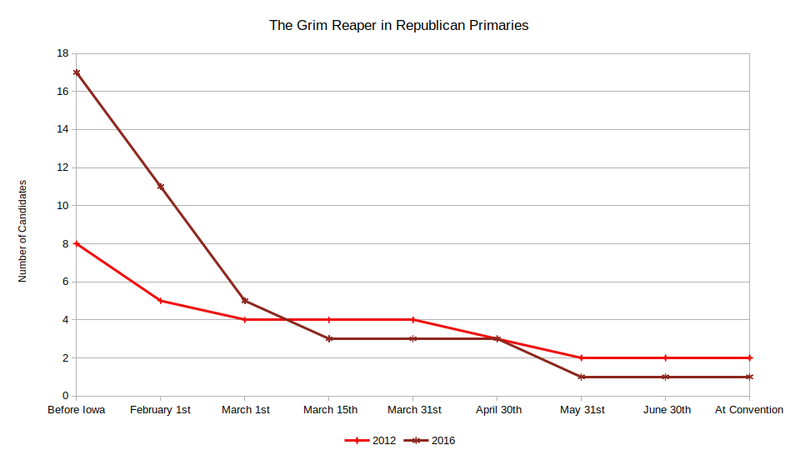 For comparison, here is the equivalent chart for the 2012 and 2016 Republican primaries. Fully seventeen candidates took to the stage in the Republican primary debates in late 2015. By March 15th just three candidates remained standing — Donald Trump, Ted Cruz, and John Kasich. A month later Trump stood alone.